If you’re in law enforcement or even you’re an adventurer, you probably understand that what you are wearing on your feet will determine your success or failure. If you dare go out wearing a pair of feeble shoes, at the end of the day, your feet will have a long story to tell, and it won’t be one with a happy ending. So, your best bet is with a pair of the hard wearing, strong and durable tactical boots on the market today. One of these spectacular boots is the Maelstrom Tac Force Tactical boots. These don’t fail to impress. They bear an elegant, stylish look that belies their rugged nature. They are nice and tall, rising to a height of 8 inches. The design is alluring, inviting you to try them on. So, let’s take them for a spin in this Maelstrom Men’s Tac Force 8 Inch Zipper Tactical Boot Review. A good pair of tactical boots must have strong soles attached. Maelstrom certainly worked hard to endow these boots with excellent outsoles. They are made of rubber which is a perfect shock resistant material. No matter the terrain, the rubber soles will absorb the strain so that your feet don’t have to. And there’s more. They also slip and oil resistant, protecting you from an accidental fall. These boots will keep you stable and safe. A collaboration of leather and fabric means not only durability but also water resistant quality. That’s right; these shoes are water resistant. Step into water or get caught out in the rain and these shoes will keep your feet nice and dry, you can be sure of that. Also, the leather is really easy to clean. All you need is a good shoe brush and some polish and get your boots shining in no time. So, yes, you can polish these boots, unlike most other boots in the market. You’re wondering how a pair of really tough tactical boots could be comfortable at the same time. Well, these Maelstrom boots have in them a removable, high performance, shock-absorbent cushion insert. It sounds like a lot, but it is simply a cushion on the inside that gives your feet a soft positioning. But that’s not enough. There is also a padded collar and tongue. These coupled with the light weight of the shoes you’ll find it easy to walk or stand for a long period. Furthermore, the cemented construction of the boots makes them flexible, relieving your feet from any strain while walking or running. 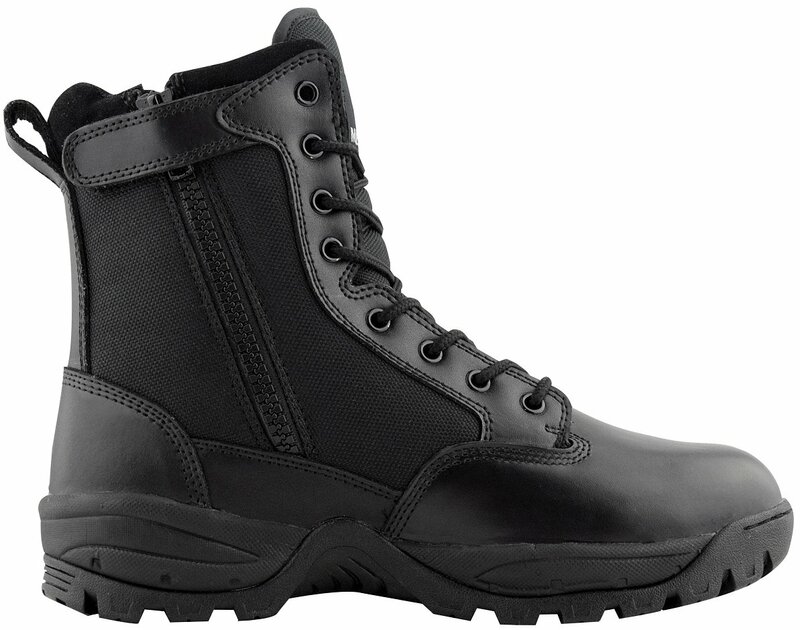 The Maelstrom Tac Force tactical boots have the wicking liner, lined within the boots. This liner graces the boots with a breathability that allows for proper airflow inside. During hot weather, the wicking liner cools down your feet and, in the process, wards off any bacterial buildup. And we all know how embarrassing bacteria can be. Even when you’re active, and a lot of heat generates inside the boots, the liner will ensure that the heat escapes and airflow to cool down your feet. Very handy, isn’t it? Don’t you just hate if it takes a long time just to put on your boots? Maelstrom thought of that and included a very convenient side zipper. This zipper runs along the length of the side of the boots, right down to your ankles. So, when in a hurry, simply unzip, slide your feet in and zip up. For added firmness, you may fasten the laces. With these boots, there is no more fumbling as you put them on or take them off. The boots have a durable rubber sole that is slip and oil resistant. The leather and fabric is easy to clean. These boots are waterproof, and of course, that will keep your feet dry no matter the conditions. You also get added comfort with the shock-absorbent cushion and the padded collar and tongue. The Wicking liner enhances airflow within the boots, keeping your feet aerated and free from bacteria. These boots are light weight and easy to walk in even for prolonged periods. The cemented construction feature makes the boots flexible and easy to walk in. There is no steel toe protection. The leather in these boots is slightly thinner than in other boots. Q: How many color options do I get for these boots? A: You can buy the boots in either black or tan color. Q: Is the leather used in these boots pure leather? A: Yes, these boots are made of 100% pure leather. So, if you’re looking for tough, durable tactical boots that won’t cost you an arm and a leg, then these should be your choice. These boots will keep your feet protected, absorbing the shock from any terrain while preventing you from slipping. The quality is also superb and will last you a long time. Another plus is their comfort. No strain is transferred to your feet even after a long day’s walk. And, of course, cleaning them is a breeze. A simple brush and polish will get them sparkling in no time. What more can you ask for? So to end this Maelstrom Men’s Tac Force 8 Inch Zipper Tactical Boot Review, we give these boots two thumbs up.